Partridge Pea/Chamaecrista fasciculata~it's not in my garden but, it might find a home here. Other than recognizing it as a pea family member I knew very little about it. I love the bright yellow petals, each with a touch of red; but, long time readers know that I try to keep my garden agreements with C and L. As pretty as these flowers are I do not think a gorgeous flowering face is enough to base a gardening relationship upon. I wanted to know more before I made a significant investment in seed or plant material. Just because they are native to Nashville doesn't mean they will successfully grow in the challenging conditions in my garden. A good way to learn about endemic plants is at local natural areas. So, I decided to watch where it was growing at Radnor Lake while walking with my friends. But, a funny thing happened while observing Partridge Pea; we noticed there were several other Fabaceae family members growing here and there. Like Southern Wild Senna. It's thriving at Radnor Lake and the Bumble Bees love it. The wildflower literature says that it's found growing in large stands in moist open woods, fields and cedar glades throughout Tennessee and the Eastern US. While I do like this legume~and those cool seedpods~it might need more moisture than Clay and Limestone can provide. Then I found Senna obtusifolia. Another good looking legume, but, it has an unpleasant odor and is an introduced subtropical species. It has great looking leaves and the flowers have a nice nodding habit, but, it's not a native. Which brings us back to Partridge Pea, sleeping plant, showy partridge pea, prairie senna, large-flowered sensitive-pea, dwarf cassia, partridge pea senna, locust weed, golden cassia. What ever it's called in your neck of the woods, this fabulous Fabaceae has excellent wildlife value. A very large and happy stand at Bison Meadows. Partridge Pea is an annual that grows about three foot tall. The small paired leafletsare light sensitive and close at night. The showy yellow and red flowers are small and grow in clusters on the stem. It's in bloom late summer through early Fall. I've not seen the fruit, but, it's described as a straight, narrow pod 1½ to 2½ inches long, which splits along 2 sutures as it dries; the pod sides spiral to expel the seeds some distance from the parent plant. I always wondered why seed pods of legumes were twisted! While it is a wonderful plant for erosion control, looks spectacular in flower, feeds critters, provides habitat, fixes nitrogen, has low water needs once established there is one caveat~partridge pea foliage is nutritious, but, it can be poisonous and should be considered potentially dangerous to cattle. I think it's safe to grow here and, yes, I did find a seed source! Welcome to Clay and Limestone's Wildflower Wednesday celebration. I am so glad you stopped by. WW is about sharing and celebrating wildflowers from all over this great big, beautiful world. Join us on the fourth Wednesday of each month. Remember, it doesn't matter if they are in bloom and, it doesn't matter if we all share the same plants; it's all about celebrating wildflowers. Please leave a comment when you add your url to Mr Linky. This post was written by Gail Eichelberger for my blog Clay and Limestone Copyright 2011. This work protected under the Digital Millennium Copyright Act. Please contact me for permission to copy, reproduce, scrape, etc. You've certainly done your homework on the Practically Perfect Partridge Pea Gail! ;) Long may it thrive, fix nitrogen in your soil, feed and shelter critters, act as nursery for your sulfur butterflies, and re-seed itself happily (but not too happily,) at Clay and Limestone. Happy WW, and thanks so much for hosting! What a fascinating plant. I like that it attract the ants, an often overlooked pollinator. Great hands on research into this plant. Hi Gail - sorry I messed with your linky but I put the wrong link for No4. Finally I've managed to join in this month......... it's been toooooooooo long hasn't it! There's nothing better than watching how a plant copes in it's natural habitat before introducing it into the garden. It certainly has great wildlife value and it must be interesting to see it close up its leaves like a mimosa at night time and watch the bees source the nectar from the base of the leaves. Partridge pea--- that's a new one for me. I do like the looks of it. I've also posted for WW, or should I say I tried to but the garden fairies took over. They do that sometimes when I am busy... they are garden fairies after all. Hi Gail - am impressed with your research and commitment to only choosing plants that like your habitat. 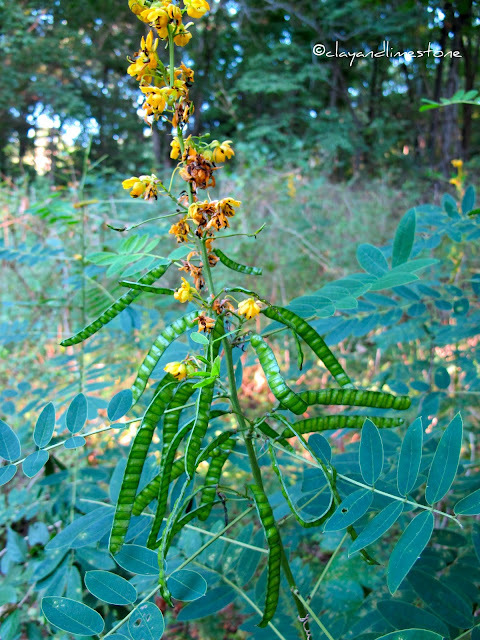 Glad the Partridge Pea will suit - it is lovely though the Senna would be more useful! My first time joining you with some of the English natives. I have a sweetpea bush in my August wildflowers. I didn't include my wild senna plants this time, but I'm thinking they are related to the plants you showed. They are small, but when fully grown should be around 5 feet tall. The one I got from Benjamin from The Deep Middle's garden was very tiny when I planted it, and I wondered if it would make it. It is now about 8 inches tall and wide. I am new to your meme, but I do have fileds of wildflowers at the farm. Sorry I did not post more today, but thank you for listing my post. What a beautiful summers day for sharing wildflowers. 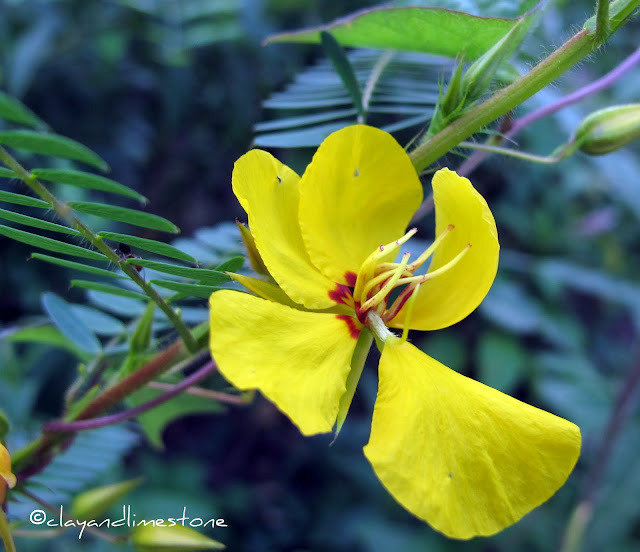 The partridge pea is so lovely. I look forward to this day to share our respective wildflowers. Have a happy WW!! You walk your talk! Certainly many native plant gardeners wouldn't take the steps you do in visiting growing site and analyzing what's there. And for that, we thank you for the leg work! I love that part of your research includes going for a walk in the woods. There's no better teacher. Beautiful plant. What an interesting plant! I always learn something new on WW, Gail, and today is no exception. I'd never heard of partridge pea before, but I happened to have my Illinois Wildflowers book handy, and there it was--yes, we have it, too! I'll have to be on the lookout for this one here. I've noticed many plants that are enjoyed by wildlife are poisonous to cattle; I wonder if cows are smart enough to leave these alone? What a delightful find. Radnor Lake is such a beautiful setting in which to see wildflowers, I wish I could walk there with you. These are all blooming now around here too. They are such a beautiful hue of yellow. I had forgotten what they were named so I am so glad you posted this. Happy WFW. A definite beauty, and not one I was was familiar with before. I just wish some of these legume species weren't so potentially toxic though. Partridge Pea looks like a winner. The flowers are beautiful. Love your inspiration for more wildflowers. I'm trying to get on with joining the Wednesday posts (I'm so terrible with schedules!). I've ordered many varieties of wildflower natives to sow this fall! I had one of these plants show up in my rose garden a couple yrs back. Strange looking plant, then I did notice the "leaves" did close at night. I let it be till pods formed. Neighbor had planted them then realized they are invasive here. Therefore I pulled it up---it was like a small tree. Pretty flowers but not here again. My first time to post on WW, I am showing some flowers now blooming, some that will hopefully bloom next year, and some fruits from some that bloomed earlier this year. Gail, lovely photography, I like the cool blue-green leaves of the Senna with the seed pods. Thanks for sharing this beauty, Gail. Happy Wildflower Wednesday! 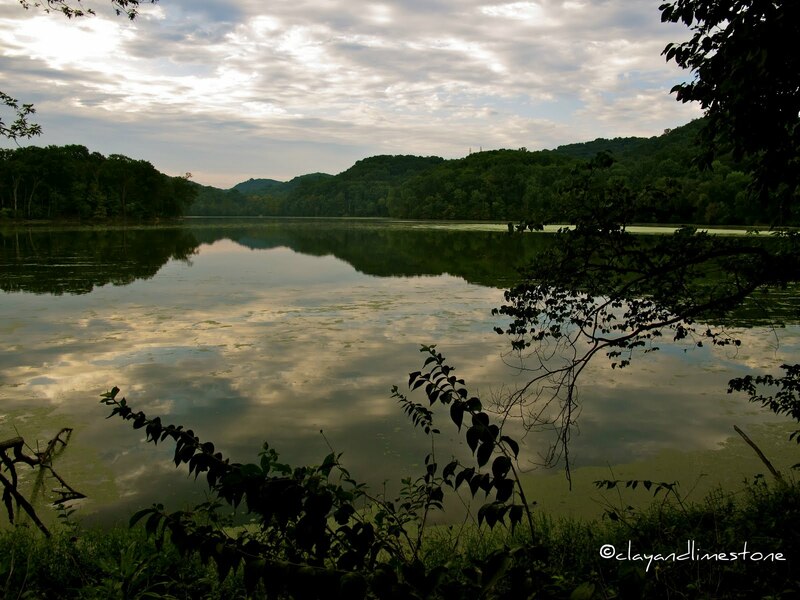 Awesome picture of Radnor Lake! I think we have some of the Senna growing wild in our garden. I'm not sure which one though. that's a particularly interesting pea family flower. nice shape and color. your lake shot is just gorgeous. i'm late with my post, but i hope you enjoy seeing marsh pink...it's very pretty, too. What a great plant--thanks for the info! I'm a day late for Wildflower Wednesday , but I'm glad I could join your celebration! Have you heard of Indigofera heterantha? It looks so similar to the Partridge Pea only the flowers are in short spikes and are lavender pink in color. The plant is a deciduous shrub. Just thought I'd mention it. I hope you find a seed source soon. I saw Partridge Pea growing at my parents house this week. It was alive with bees. i am new at our group "wild wednesday" .... i love gardening and i m fascinated by wild flower ... for me they seems to be more exotic n delicate than normally grown garden flower. happy to join this group ... hope i remember to post my wild flower next month !! after entering my name n url ... it say leave a comment - i hope this is where i had to ! Gail dear your photos of this fabulous plant are wonderful! I love the leaf forms, flowers and seed pods. A win win plant. I recognize this plant, it grows wild around here also. Very pretty, and bright. Thanks for explaining it, next time I will take a closer look at it.